Grad School. They are Like Mushrooms. They pop up like mushrooms after a heavy rain. In every city big enough to sport a Starbucks, there has risen a food-obsessed, local-inspired, heavily tattooed, sticker-adorned, farm to table establishment with clusters of young people spilling out onto patios and front benches. Done well, they are lovely. And Grad School, in a far corner of the blip of downtown of Springfield, MO, is done well. On the continuum between well-funded subway-tiled newcomers and the ramshackle joints one gust of wind away from a pile of rubble, Grad School is one of the dives. 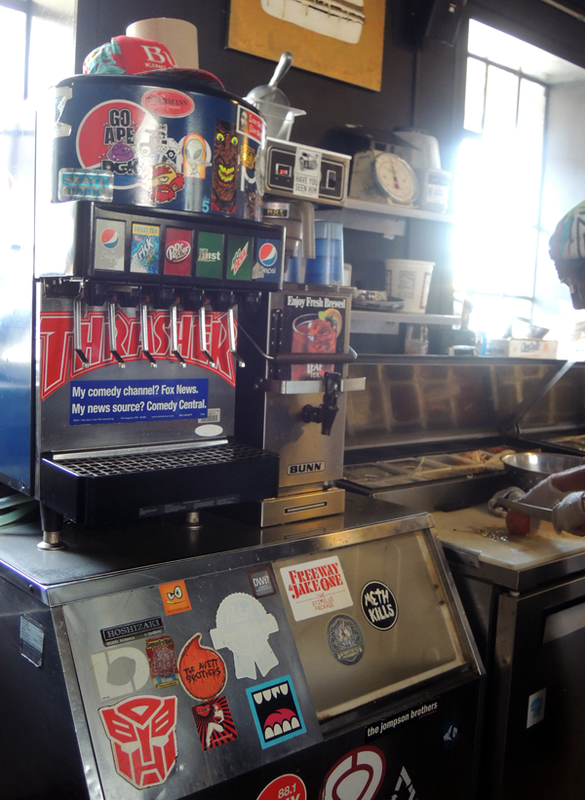 This is a place where all of the stickers covering the soda machine are covered with stickers, and all of those are covered with a slight sheen of grease from fryer. It's a tiny restaurant, with one long room holding the open kitchen, a couple of bar stools and a handful of tiny high tops; a little back room with two sets of vinyl booths; and one long table out on the patio. Everything is narrow enough that navigation is an art. At 2:00 in the afternoon on a Saturday it was still packed, and there was still a wait. The reason was clear. It's impossible to go to Grad School and not smile. Everyone is happy. The food is dead-on target. The chairs don't match. A couple of high points. The pesto vinaigrette on the house salad. A place this greasy is not supposed to have things this green. It was perfectly dressed and backyard garden level fresh. The french fries. Nothing fancy just skin on, crispy, hand cut brilliant fries. They were amazing when they came out piping hot. They were amazing 15 minutes later when lesser fries would have wilted into sadness. The soft cheddar on the Full Ride. Don't bite into this thinking it's a typical cheese burger. The soft cheddar melts into more of a lush sauce than a gooey bit of cheese. But it's dynamite. Sharp and silky and a perfect foil for the double burger. Not for the faint of heart. The why-the-hell-not touches on the dishes, like the decorative swash of sriracha on the Micah's chicken. This is a delicious little quasi-asian sort of sesame chicken and rice number, and it's presentation was full on fancy. It was kind of brilliant next to the giant plastic Pepsi Cola cups we were drinking out of. Low points were few and far between. It took a while for the food to come - but it was a happy while - and the jerk chicken was not quite up to the brilliance of the other plates (though the bits of pineapple were genius). And they should maybe dust the ceiling fans.